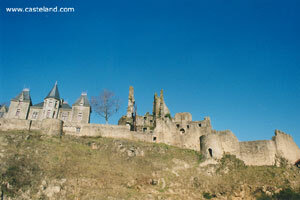 The castle of Bressuire curious for its architecture at the Average Age, is quoted for the first time in 1069. It was contruit at the beginning of XIe century. Thibaut de Beaumont, who founded the church Our Lady of Bressuire, is the first known lord. Its rectangular keep furnished with buttresses surmounts the hill. Formed of two enclosures, the first date of XIe century, second is raised by Raoul 1st of Beaumont. 38 grosses towers furnishing an enclosure measuring nearly 700 meters encircle a premiére fortress which eight grosses towers defend. Today, some are restored while of other are left with the abandonment.